Every workplace chooses its employees carefully and only those are chosen that have the stamina and the caliber to meet the professional requirements of the workplace. The office’s HR team has the data of every employee’s performance and a record of his professional behavior and credibility. To enhance the productivity of your employees and the quality of work that is produced by your company, you have to take into consideration the reviews if the employees about the environment of the workplace, facilities, and attitude of the employers towards them. This can create a healthy atmosphere for the work and growth of the business. The employees want to be heard and cared. You have to give them a chance to share their thoughts about the workplace. This will give you a clear insight into the problems that you can solve while hiring a new employee or dealing with the employee problems. A trustworthy and strong relationship is established between the employer and the employee. It is essential to have a motivated workforce. You can motivate the employees by asking them about the facilities and benefits they think they want to have in the workplace. You can ask them about the leaves and holidays given to them and if they are sufficient for them. A feedback should be conducted on regular basis to evaluate the workplace. A feedback form should be given to every employee from the lower clerk to the managers. Sufficient time for filling out the form should be provided to the employees. Try to provide some incentives in the feedback form. Ask them if they understand the working policy of the company. Ask them about the environment of the workplace and the behavior of their coworkers. Ask them about the turnover of their department and the role of their manager in it. A lot of companies conduct weekly feedback forms and have declared it beneficial in increasing the work quality. 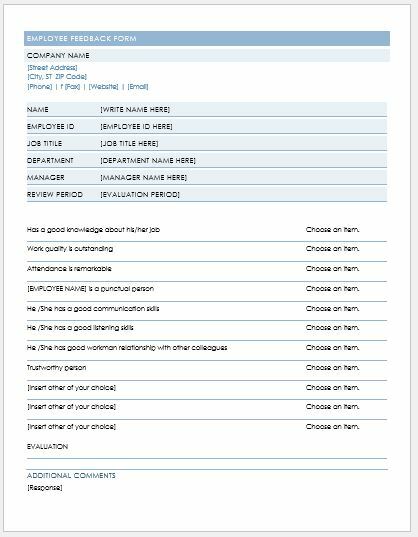 A form is created by our professional to help you conduct an employee feedback of your company.